Break the cycle of fatigue, reclaim rest, and awaken your true nature with a 40-day yoga nidra program for women. If you’re like most modern women, you’re often too exhausted to do anything but get through the day. Deep down, you crave more freedom, creativity, meaning, and love—but actually living those qualities seems impossible. In The Daring to Rest Yoga Nidra Meditation Program, women’s health pioneer Karen Brody presents a groundbreaking training to help you completely reboot your system so you can dream big and lead from a deeply well-rested place. Yoga nidra, a type of guided meditation done while lying down, takes you into the deepest state of relaxation possible by directly accessing your subconscious mind. Even if you’ve never felt able to meditate—even if you fall asleep!—these practices help shift and heal long-held patterns. 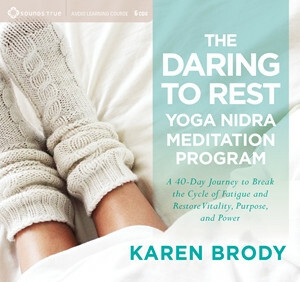 With The Daring to Rest Yoga Nidra Meditation Program, Brody shares her signature training, which brings together guided meditation, breath work, journaling prompts, and other techniques to help you reclaim rest and tap into your authentic power. Your 40-day yoga nidra journey progresses in three phases, each addressing a different layer of exhaustion: rest, for physical exhaustion; release, for mental and emotional exhaustion; and rise, for the “life purpose exhaustion√ that can come when you’re not fully empowered. As you balance your subtle body energy and rewire your nervous system on a cellular level, you’ll open the way for your true, well-rested self to emerge. The Daring to Rest Yoga Nidra Meditation Program offers women a revolutionary path to healing—one that is feminine, nourishing, and empowering. Take 40 days to be good to yourself and see what unfolds.